Love. You could smell it in the air as Valentine's Day approached. Or maybe it was the smell of 15 eager teams ready to compete in a rousing round of trivia. Or maybe it was the smell of buffalo cauliflower in my general vicinity. Probably a little of all three. It was a hotly contested battle tonight, with leads switching throughout the whole evening. In the end, the comeback kings/queens were the Bean Counters, coming from down early to finish with a whopping 74 points. -The team Ovaries Before Broveries, for having the team name Ovaries Before Broveries. -Second-place team Kate Beckinsailors wins best dressed with their matching white sailor hats. -The drinking round consisted of naming celebrity couples based off their name. I think I speak for all of us when I say the people miss "Taylor Squared". 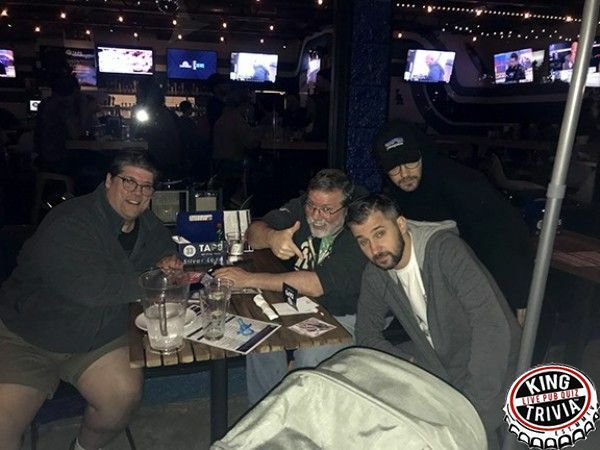 Another week, another gathering of the world's greatest trivia minds at 33 Taps. There was something extra spicy in the crowd tonight, and it wasn't just the rendition of Paula Abdul's "Straight Up" that was played several times throughout the evening. In the end, Tried and Trivial pulled out with the W by the slimmest of margins. -->Did I mention Paula Abdul played during the evening? -->For the drinking round, all February birthdays were treated to a round of speed trivia. Happy birthday all you Aquarius and Pisces kids! --> At one point Damian, one of 33 Taps servers, hit a high note while singing to a song. It was glorious. It was a Wednesday night to remember at 33 Taps in Silverlake. 20-teams joined the ruckus for a whirlwind night of King Trivia. The battle for the top three spots literally changed every single round. The Bean Counters pulled ahead late after doubling-down on 3 different rounds. Ben Got Kicked in the Face finished in 2nd, and the third place spot was claimed by The Pink Cowboys, who edged out Tried & Trivial by a single point. Many teams ship wrecked on round 6 by unsuccessfully doubling down ("I'm an alligator. I'm a mama-papa coming for you." - was a line from David Bowie not the Beatles). Can't wait until next week. See y'all at 8pm on Wednesday at 33 Taps in Silverlake. Go Rams!! !